Delayed definitive interventions for patients with upper urinary tract obstruction are performed for patients who have responded appropriately to temporary drainage. Most commonly this is the stone patient that for one reason or another required a temporary drainage procedure. After resolution of the underlying treatment concerns (i.e., infection, inflammation, etc. ), definitive stone treatment can be given with endourologic techniques catering to the size, location, and laterality of the stones. In most instances, a minimum delay of 2-3 weeks is needed before definitive treatment is performed. For upper urinary tract obstruction unrelated to stone disease, delayed definitive interventions are also undertaken once the additional diagnostic workup has been completed to recommend optimal treatment. The complete diagnostic workup and must be tailored to the individual patient. When obstruction is unrelated to stone disease and the patient presents urgently, emphasis is typically first made on temporizing interventions. Once the patient's obstruction has been temporarily relieved and once the urgent presenting signs and symptoms have been stabilized, additional diagnostic and therapeutic intervention is based predominantly on the radiographic evaluation. Not uncommonly, the diagnostic workup can be completed on an outpatient basis after the patient has been released from the acute care setting. 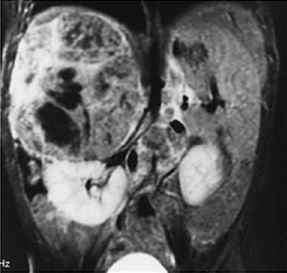 A discussion of definitive treatment options for the variety of problems associated with upper urinary tract obstruction is beyond the scope of this chapter.